With the introduction of the GR-55, Roland unveiled the most versatile and powerful guitar synthesis system ever created. Yet the incredible GR-55 lacks many of the expansion capabilities and control options found on previous guitar synthesizers. 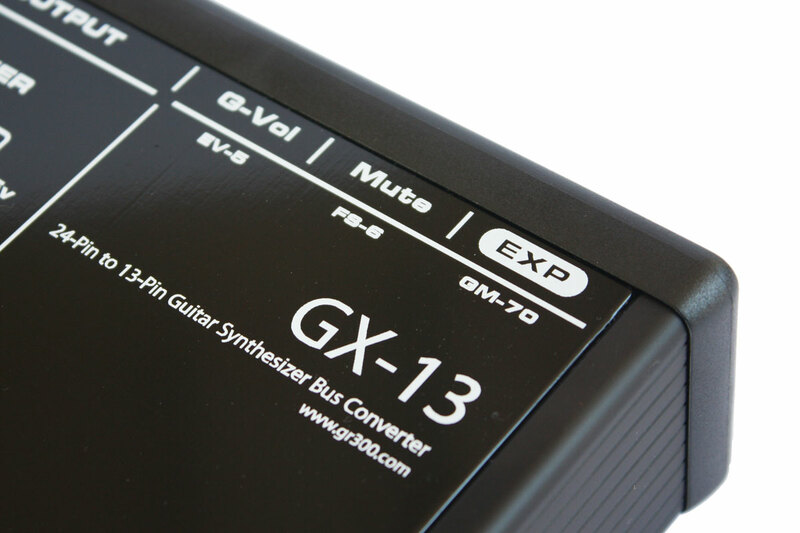 The GX-13 is specifically designed to bring new levels of creative expression to the GR-55 by using vintage Roland guitar synth controllers like the G-202/303/505 etc. to drive the GR-55. 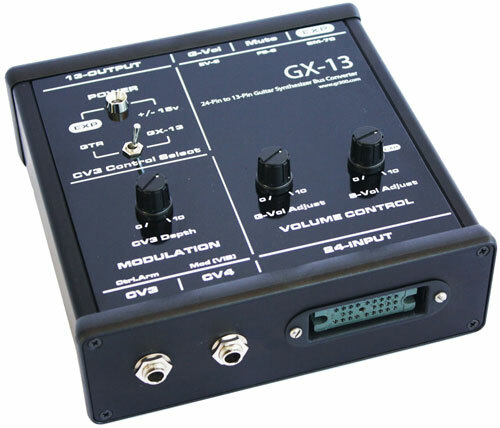 Unique to the GX-13 is the ability to simultaneously generate MIDI control signals while playing a 13-pin synth like the GR-55. 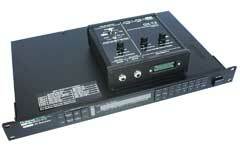 The GX-13 can also work without the included modified GM-70, functioning as a rare, hard-to-find Roland BC-13. 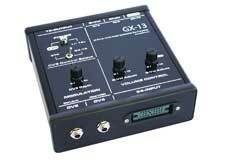 But the GX-13 goes beyond the BC-13, adding more features. 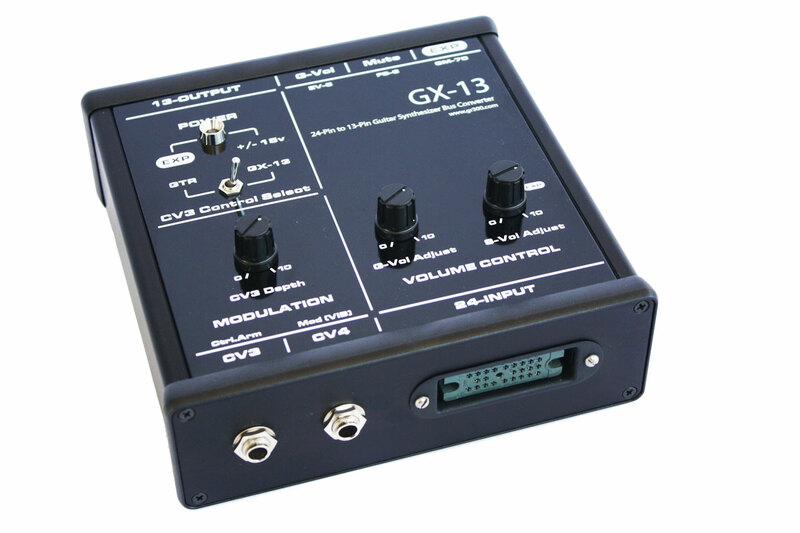 In addition to converting 24-pin signals to the 13-pin format, the GX-13 has a control for adjusting the response range of the GK Volume control, and for setting the level of the normal guitar signal as well. 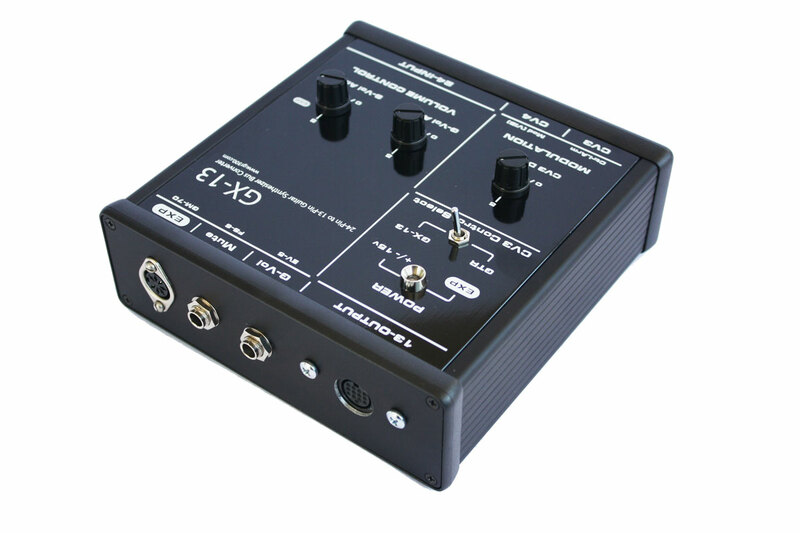 The rear panel has an input for a optional Roland EV-5 for foot pedal control of the normal guitar signal, for hands-free volume swells! There is also a tip-ring-sleeve mute input designed for the Roland FS-6. 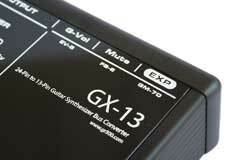 The operation of the GX-13 is transparent to the attached 13-pin synthesier.. 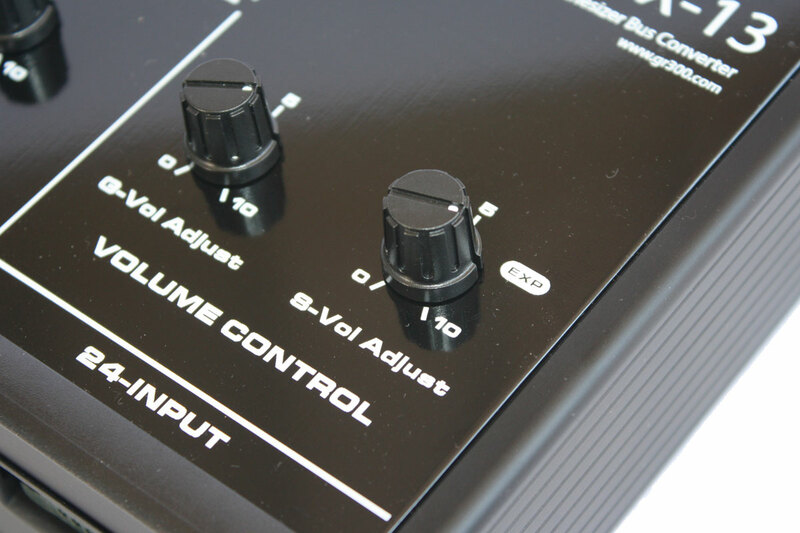 The vintage Roland guitar synth specification supports four control voltages, assigned to filter cutoff, resonance, pitch and modulation. 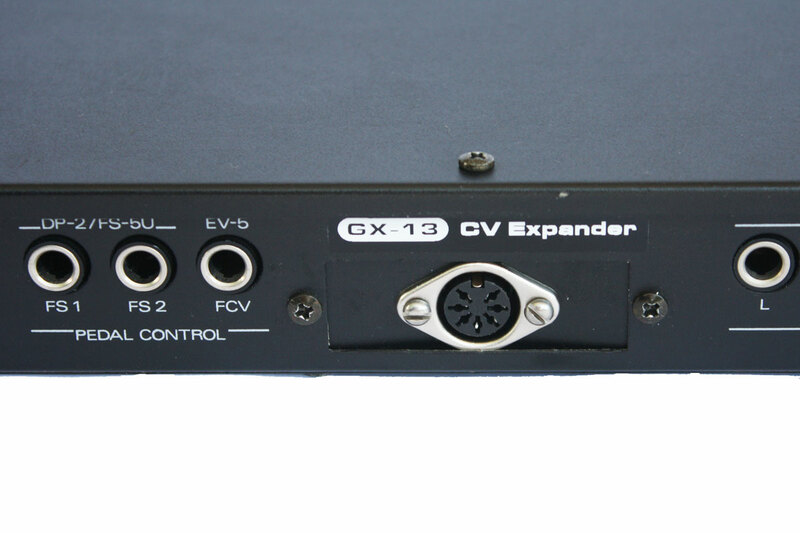 These control voltages are split off in the GX-13, and sent to a modified Roland GM-70, which converts the signals into MIDI continuous controllers. 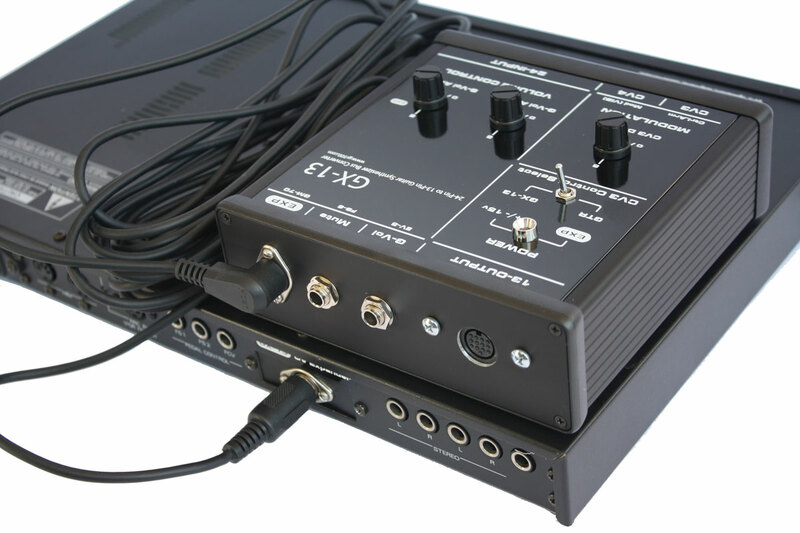 A special 7-pin cable connects the GX-13 to the modified Roland GM-70, and the GM-70 then generates continuous MIDI controller commands from the control voltages. The vintage control voltages: CV1 = filter cutoff, CV2 = resonance (edit), CV3 = Control Arm (IMG2010 whammy bar), and CV4 = modulation/vibrato. 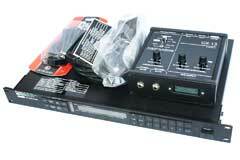 While Roland includes control voltage 3, CV3, in technical documentation, only the Ibanez IMG2010 guitar outputs CV3, pitch control, with its Control Arm/Virtual Whammy Bar. 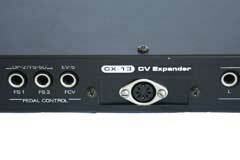 To make use of this control voltage, a top panel switch selects between the internal GX-13 CV3 control, and the pitch control signal sent by an IMG2010. 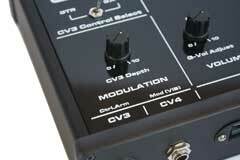 A front panel EV-5 pedal input adds more control over CV3 depth. 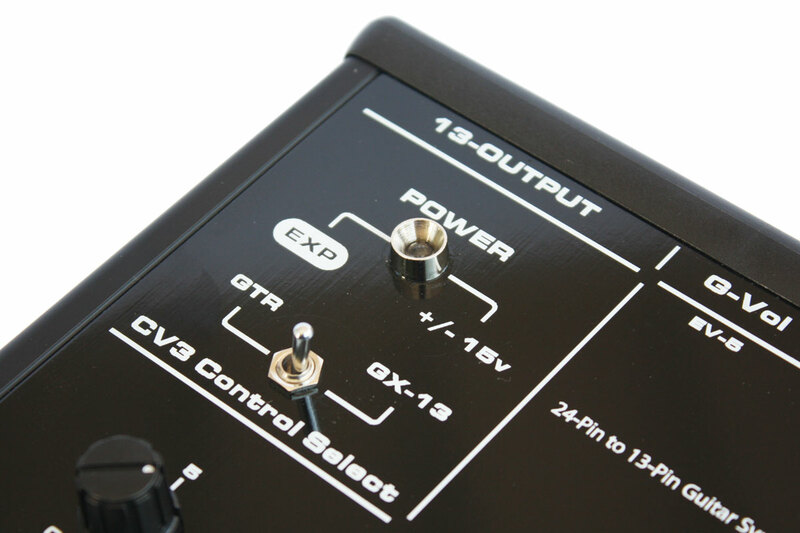 Since some players find the CV4 modulation/touch pads difficult to use on vintage Roland guitars, the GX-13 has a front panel EV-5 input for CV4. Plugging a Roland EV-5 into this jack overrides the guitar modulation control. With the GX-13 and the modified Roland GM-70, anybody can recreate the experience of playing a vintage Roland GR-300 with a vintage guitar synth controller. 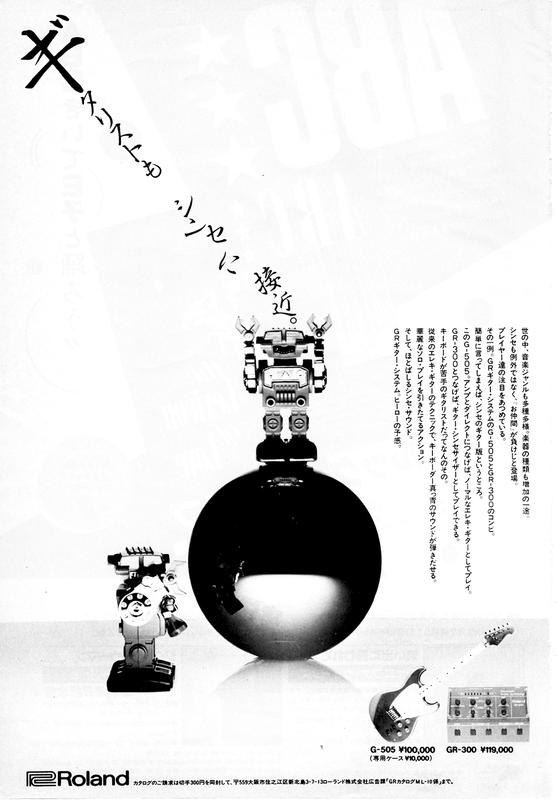 art of the inspiration, and fun, of playing a GR-300 is the real time interaction between the controls on the guitar, and the sound of an analog synthesizer. 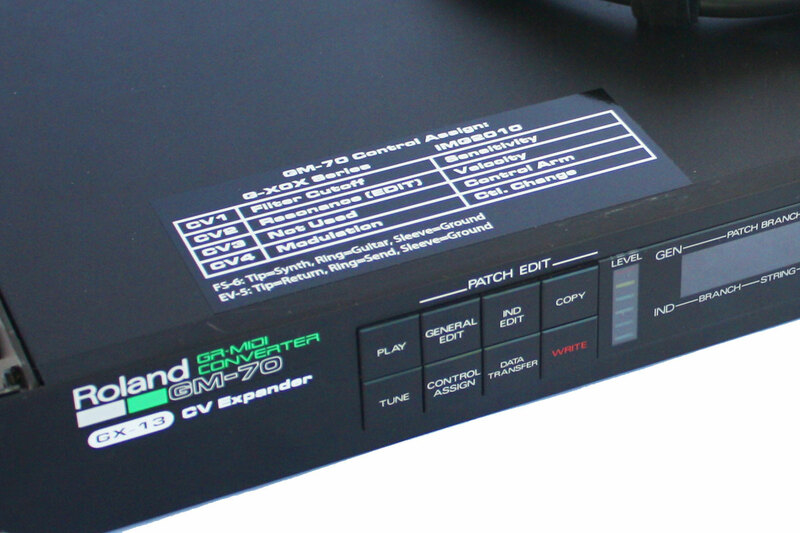 This video clip goes through the details of setting the controller assignments in the modified Roland GM-70, and in a Roland GR-55. 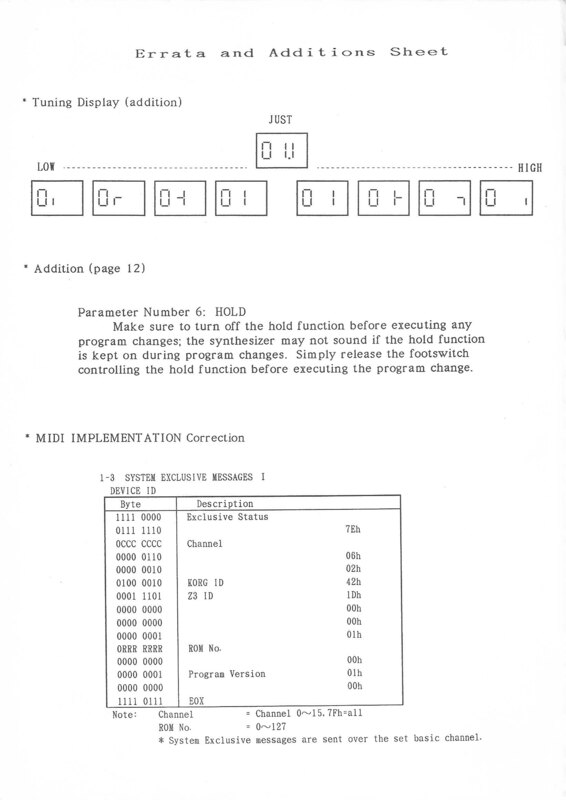 In addition to covering the basics such as filter cutoff, resonance, and LFO depth, the many control sources on the GM-70 can be assigned to other GR-300 parameters, such a LFO speed. 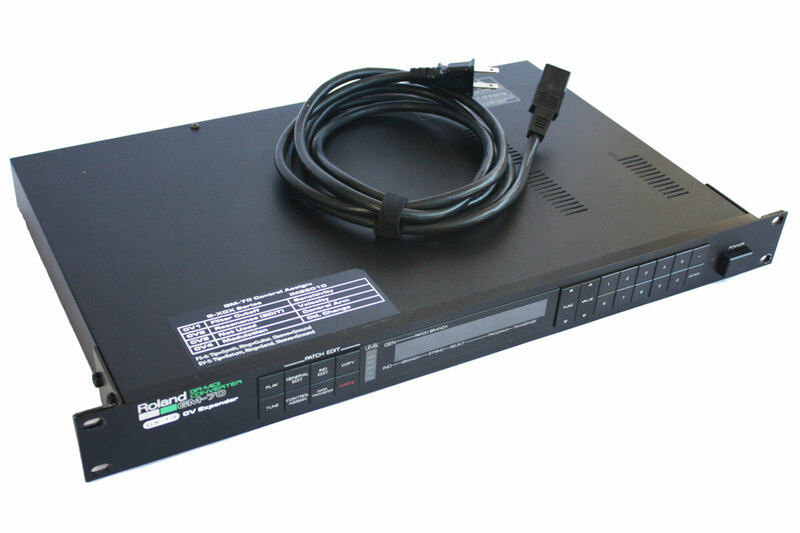 Using the 2 rear panel FS-5U foot switches pitch preset A and B can be easily recalled, just like on the original Roland GR-300. An optional Roland FC-100 is plugged into the GM-70, and the foot switch on the FC-100 is used to engage Duet mode in the virtual GR-300, and a EV-5 pedal plugged into the FC-100 is used as the control source for pedal bend.